Turin, Biblioteca Reale, no. 16043. Pen and ink and wash, heightened with white, over traces of black chalk, 40.7 x 31.8. 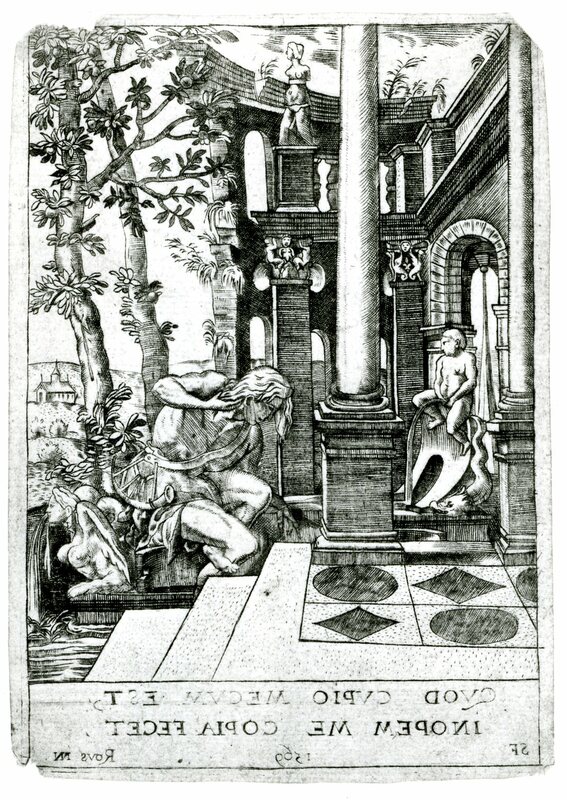 As known from Étienne Delaune’s print of this scene (Fig.E.49), the drawing has been slightly trimmed at the top and left and considerably more at the right and bottom, removing thereby a second column at the right and the foreground of the perspective below. Inscribed in ink at the lower left: S martin de / boulogne — ou / Le bollognois. A note by Popham on the mount attributes the drawing to Rosso. Bertini, BdA, 1952, 313-314, Fig. 7, as an academic and partially unfaithful copy after Rosso by a copyist influenced by Primaticcio. Bertini, 1958, 51, no. 380, and Fig., as a copy after Rosso as indicated by an inscription on an engraving of the composition, and as by a copyist influenced by Primaticcio. Carroll, 1964 (1976), I, Bk. I, 262-263, II, Bk. II, 442-443, D.55, Bk. III, Fig. 136a, as a copy of a lost drawing by Rosso of around 1538-1539, probably by Étienne Delaune. Zerner, in EdF, 1972, 253-254, under no. 291, reported Béguin’s opinion that the drawing is a copy of a French drawing by Rosso (the reference here to Berlin is a misprint for Bertini). Carroll, 1987, 194, 196-197, ns. 3-4, under no. 64, as a copy of a lost drawing of 1531 or 1532, and probably by Delaune. Boorsch, in French Renaissance, 1994, 281, 282, n. 7, as Rosso, presumably a copy, perhaps by Delaune. 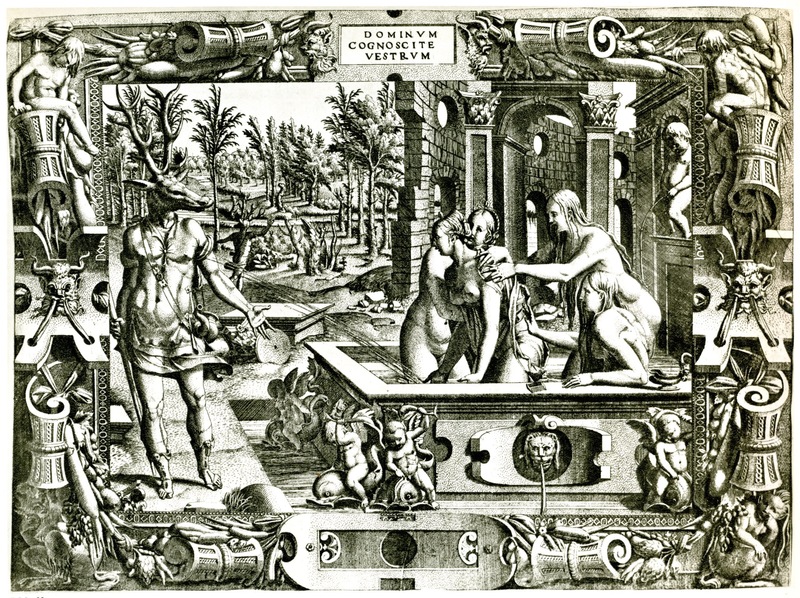 The inscription to Rosso on Delaune’s very small engraving of this scene (Fig.E.49) supports Pophams’s attribution, which may have been made without knowledge of the print. 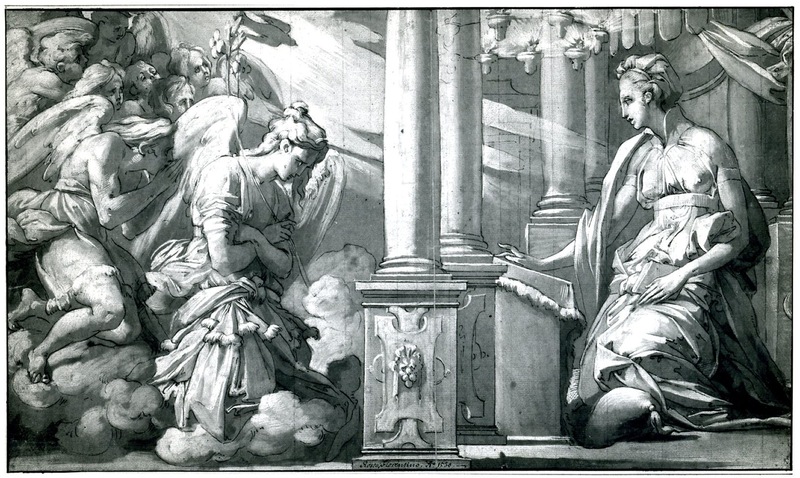 The figures, the architecture, and the composition of the Turin drawing are very closely related to those of Rosso’s Annunciation drawing in the Albertina (Fig.D.43a). Narcissus’s profile is quite like that of the Virgin in that drawing, his hair is like Gabriel’s, and his muscular body is similar to that of the angel’s with his hands held up before his face. So similar are these two works that it is most likely that they were invented about the same time, probably in 1531 or 1532, although as with the former the date of the latter could be slightly later. 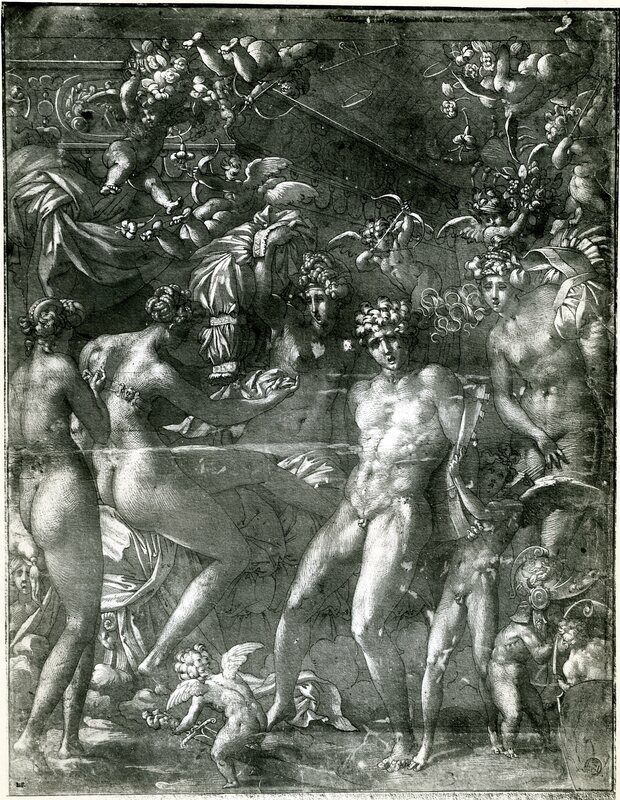 However, the Narcissus would seem not to have been invented after 1535, when Rosso’s style takes on certain characteristics that do not appear in the Turin drawing. Although the draughtsmanship is too hard and too slick to be identified as Rosso’s own, it does bear some resemblance to that of the Annunciation. The Narcissus would seem to be an accurate copy of a lost drawing by Rosso. However, one is inclined to wonder if the original drawing was done on a dark ground like the Annunciation and the Mars and Venus of 1530 (Fig.D.42a). If it was, then the tonality of the original and the effects of light in it would have been somewhat different. It is, in fact, the special character of Rosso’s light that is so much missing from the copy in Turin. 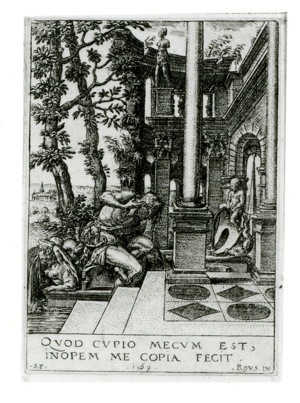 The actual handling of the drawing suggests that the copyist was Étienne Delaune, the draughtsmanship of whose Children’s Games, of around 1560,1 in the Louvre, is particularly similar to that of the Narcissus. But nothing of the imagery of the drawing recalls Delaune’s art, which may indicate how careful a copy the Turin drawing is. The rotund forms of Narcissus’s body may reveal the influence of Primaticcio’s style upon the copyist. The Turin drawing did not serve as the direct model from which the design was traced onto the engraver’s plate as the print is of miniature size while the drawing is quite large. Rosso’s lost drawing was probably the same size as the copy. In the drawing, the copyist had some difficulty defining the curved base on which the peeing putto sits. This detail in Delaune’s engraving is also not surely rendered. PRINTS: Étienne Delaune, E.49 (Fig.E.49). Engraving, in the same direction as the drawing, which, however, is considerably larger although it seems to have been made to serve as the model for the very small engraving. Anonymous, E.134 (Fig.E.134). Engraving. 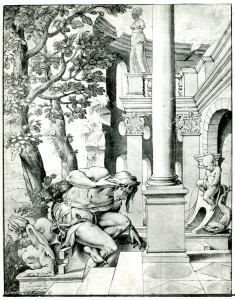 A large copy of Delaune’s print, in the same direction. Jean Mignon, Diana and Acteon, etching, 43 x 57.5 (Zerner, Vienna), inscribed on a plaque at top: DOMINUM (the N backwards)/ COGNOSCITE/VESTRUM (Fig.Mignon). COLLECTIONS: New York, 1980-1094. 3. Paris, Ed 8b, Vol. II. Vienna. LITERATURE: Bartsch, XVI, 1818, 404, 73, as anonymous, School of Fontainebleau, seemingly after Luca Penni. Herbet, IV, 1900, 336 (1969, 238), 22, as Mignon, after Penni; Herbet also mentioned a small copy in reverse differently inscribed. Adhémar, 1946, Pl. XIV, as Mignon, after Penni, c. 1550. Zerner, 1969, J.M. 60, the composition surely by Penni with the background probably by Mignon; Zerner also mentioned that there are numerous copies of and derivations from this print. Béguin, RdA, 1969, 107, Fig. 18, reproduced a picture of this scene in the château at Prague. Zerner, IB, 33, 1979, 348. E. Hevers, in Zauber der Medusa, 1987, 240, no. V, 10, Fig. (Paris). Boorsch, in French Renaissance, 1994, 280-282, with Fig, no. 62, as after Luca Penni, and likely made during the reign of Henri II, the relief at Écouen probably made from a drawing by Penni rather than from the print. The architecture and peeing boy are variations on those in Rosso’s Narcissus (see Carroll, 1987, 197, n. 12). Suzanne Boorsch suggested to me that the different angle of vision in the two works could indicate that such a fountain and setting actually existed at Fontainebleau. Although possible, the kinds and number of differences suggest to me Penni’s working from and altering for his purposes Rosso’s conception. Boorsch also brought to my attention the similar peeing putti in Boyvin’s print of Ceres, after Thiry, in the set of Sixteen or Twenty Panels of Ornament with Pagan Gods (RE.14; Levron, 1941, Pl. LXII). 1 See Adhémar, 1954, Pl. 45.